Please select a size. EU 35 ½ - In StockEU 37 - In StockEU 38 - In StockEU 39 - In StockEU 40 ½ - Low StockEU 42 - Email me when back in stock Please select a size. This season, give your street-style looks a fierce PUMA boost with their latest silhouette. 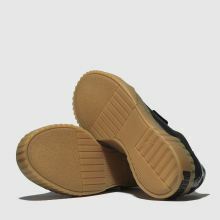 Arriving to lead your rotation, the Cali Nubuck features an all-black nubuck upper with contrast white branding while a cleated gum outsole wraps onto the upper.